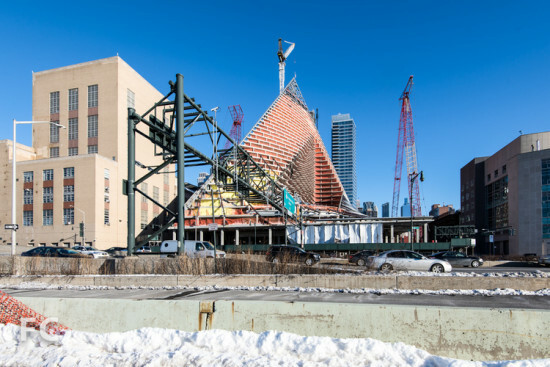 Bjarke Ingels Group (BIG) is off the rails lately, netting commission after commission. Five years ago, BIG set up shop stateside to supervise W57, the "courtscraper" along the West Side Highway—the firm's first New York City project. They have since collected an impressive portfolio of planned projects, and AN hears there's more on the way. 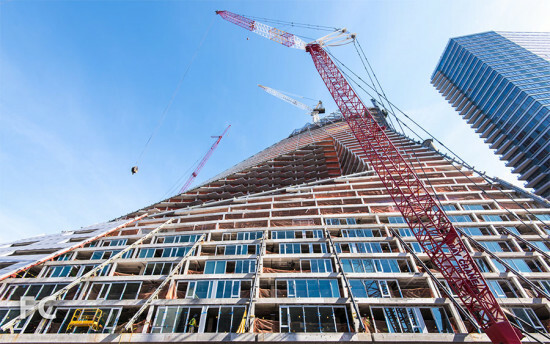 It is almost unreal to hear rumors about another possible tower in Tribeca, a second westside project near the High Line, and an Upper East Side supertall tower in the pipeline. BIG could have seven large projects that would come to fruition in the next decade or so. Talk about a BIG Apple! W57, meanwhile, is well under construction. 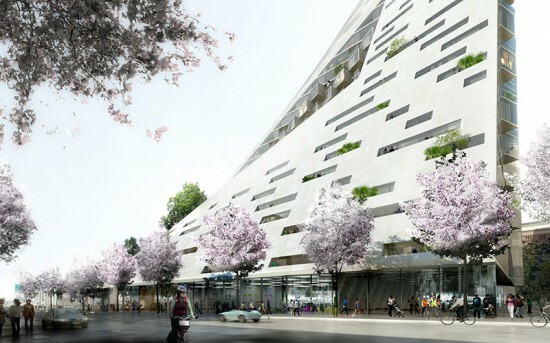 At 126th Street, BIG's project in Harlem (now in design development) would cantilever over Gotham Plaza on 125th Street. The building allegedly contains mostly studios and one-bedrooms, and there are approximately 233 total units—47 of these will be affordable. The project formerly known as the Dryline or "BIG U" is being implemented, with modifications, as the East Side Coastal Resiliency Project (ESCRP). BIG U called for ten unbroken miles of flood protection in Manhattan, from West 57th Street, looping south to the Battery and up the East River to 42nd Street. When AN checked in on the project this October, BIG U was scaled back due to funding constraints. 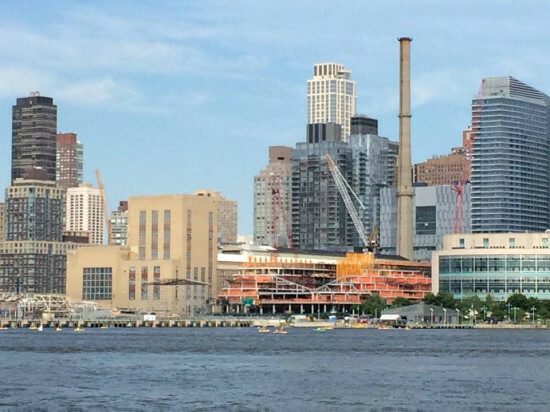 The $335 million ESCRP will create retractable flood barriers, berms, and floodwalls in the East River from Montgomery Street to East 23rd Street. Construction is slated to begin in 2017. BIG was one of the last starchitecture firms to get a High Line commission. 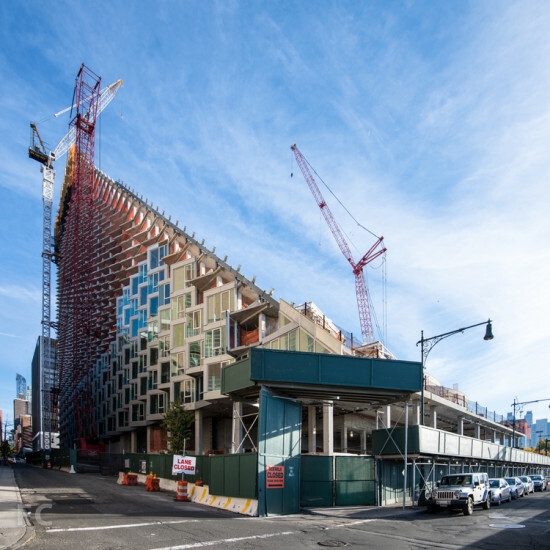 Good things come to those who wait: the two tower HZF High Line project, at Eleventh Avenue and 17th Street, feature 300 apartments (most with two and three bedrooms), 50,00 square feet of ground floor retail, and a three-level, 150,000-square-foot hotel. The 38 story (402 feet) western tower will its 28 story (302 feet) sibling tower to the east. The towers are expected to be complete by 2018. The stepped, 1,340-foot-tall Two World Trade Center is in design development. When it opens in 2020, it will make a dramatic impact on the skyline from all angles. 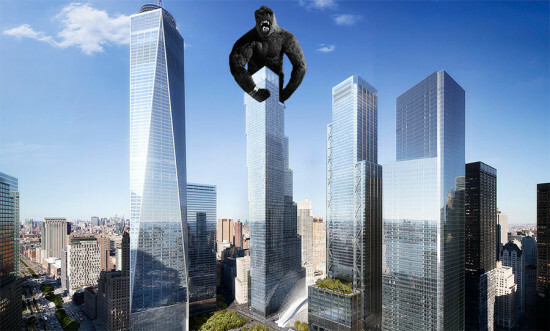 If King Kong decides to terrorize Manhattan again, he'll have the perfect building to climb. The Durst Organization is launching a composting pilot program for the 600-unit Helena apartment building on Manhattan's West 57th Street. 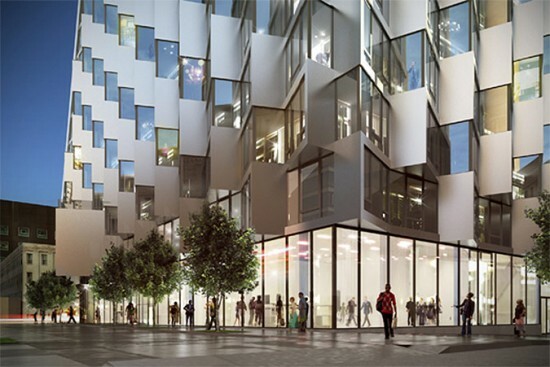 The program will start in the next few months and, if successful, will be implemented in Durst's planned 32-story W57 tower designed by Bjarke Ingels and expected to finish in 2015. 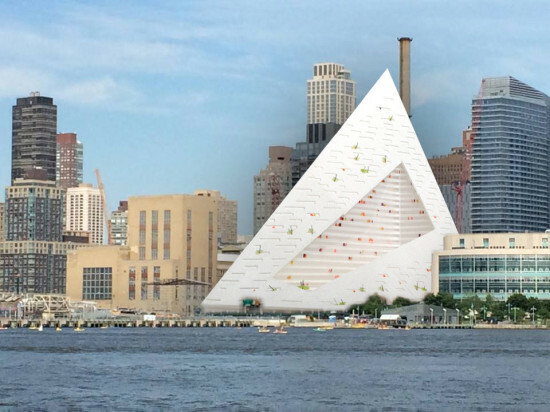 This composting scheme, potentially serving 1,350 apartments, will be the largest residential composting project in the New York City. Instead of lugging compost to collecting centers throughout the city, compost at Durst's towers can be tossed out and picked up much like recycling. Tenants will gather their apple cores, eggshells, and other compost-able goods into a biodegradable paper bag and toss them into a communal garbage bin in the building’s garbage room. From there the waste will be picked up three times weekly and schlepped away to Riker’s Island to become fertilizer.